Found along the shores of Lake Massawippi in Canada, Manoir Hovey is an award-winning five star venue that has been labelled a national treasure by critics and guests. Taking guests back to the regal quality of the early 1900’s, Manoir Hovey is surrounded by rolling lawns and sweeping countryside views. 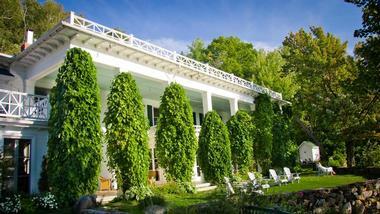 At Manoir Hovey, old-world charm meets modern luxury combined with exceptional service. Heading to the property is akin to spending time at a rich relative’s country estate. Guests are surrounded by fresh air and decadent dining at the Southern-styled venue. Whilst the latest owners of the manor have taken ever care to preserve the estate, modern comforts have been added – however these additions blend in perfectly with the original theme and décor. Manoir Hovey is a member of the Relais & Châteaux hotel association. 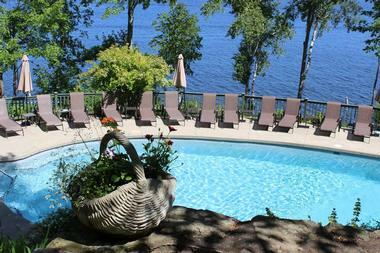 Manoir Hovey boasts 37 rooms and suites, with most of them showing off panoramic views over the lake. Rooms at the hotel are a marriage of classic and modern designs. To keep guests in prime comfort, all rooms have coffee machines and flat screen TVs. They are also kitted out with amenities such as bathrobes and L’Occitane products as well as therapeutic bathtubs. The Standard Rooms are quaint spaces that boast a queen bed, as well as views showing off the garden or lake. There is also an en suite bathroom with full amenities. More spacious than the standard, the Superior Rooms are all individually decorated with a queen bed and have either garden or lake views. Owing to the unique design of every room, guests may be privy to a fireplace, balcony or therapeutic baths. Enhancing the luxury factor, the Deluxe Rooms have queen or king beds and some of them have private patios. Guests may also have access to single or double baths or they can unwind with a gas fireplace. For those who have a little business to take care of, the work area provides the space to do so. The epitome of grace and elegance, the Luxury Rooms are equipped with queen or king beds as well as all expected amenities. The thing that makes these rooms unique are the large bathrooms boasting double therapeutic baths and a shower that is separate. The Massawippi Suite was built in May of 2011 and boasts 500 feet of space and luxury. As the only suite that can be found in the Manor House, it has a king size bed and a very large balcony with views of the lake and the English gardens at the hotel. Guests will find themselves completely immersed in another world as they step into the all-white oversized marble bathroom. Heated floors keep things snug, while the bath tub and separate shower provide a touch of luxury. Lastly, the suite also has a fireplace, where guests can unwind with a glass of wine. Living up to its name, the Montcalm Suite exemplifies relaxation with a décor scheme boasting soothing shades of grey, white and green – designed to match the surroundings. The suite has a king bed and takes guests back in time with a porch that is screened-in on the private deck. The bathroom is found through the walk-in closet and has heated floors as well as an impressive oval soaking tub with air jets. This bathtub allows for views over the lake from its alcove setting in the bay window area. The Treetops Suites are two units found in a country cottage elegantly perched atop a small cliff boasting views over the Manoir Hovey. Unwind in a real fairy tale setting with canopy beds and porches looking out over the lake as well as cathedral ceilings. When heading down to the Manoir Hovey, a lighted staircase shows the way through the woods. The Cartier Suite is a secluded cottage found on the lakeshore. 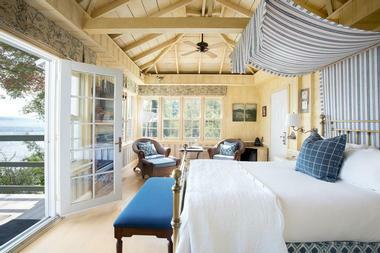 Here, guests lay their heads down on a four-poster queen bed or relax with a view over the lake from the private deck. If staying indoors becomes stale, guests also have a private dock where they can make use of their own kayak and canoe. The Oriole Suite is a one bedroom suite that sits next to the Heron Cottage on the cliff overlooking the manor. The bedrooms and bathroom both have heated floors and are oversized to enhance the luxurious feel. From the main bedroom, guests have access to a hot tub on the private deck. In the living room, entertainment and relaxation are taken care of with a flat screen TV, easy chairs and gas fireplaces. When heading down to the main house, guests are guided by a lighted stairway along the bluff. Found next to the Oriole Suite, the Heron Suite is 1400 square feet of fairy tale luxury found on a ridge that overlooks the manor. The suite is surrounded by manicured grounds and a pool as well as a hot tub. Here, guests are taken in by oversized spaces that are kept snug with underfloor heating. The Heron Suite has two bedrooms, each containing a king bed. In the master bathroom, a double whirlpool bath welcomes guests to unwind, while the second bathroom has a glass shower. Those on the hunt for comfort may choose one of the two fireplaces to set the scene, or they can take in the views from the porch. The Le Hatley Restaurant at the Manoir Hovoy creates a blend of regional fair that showcases the seasonal flavors of the area. These flavors are sourced from the surrounding forests, fields, rivers and lakes. Headed by Chef Wolf, the restaurant prescribes to his method of foraging and growing what you need, as well as sourcing from local farmers. The menu is designed around seven flavor profiles that are attributed to the Quebec region. A prominent example of this is the use of birch syrup and vinegar sourced from this local tree. 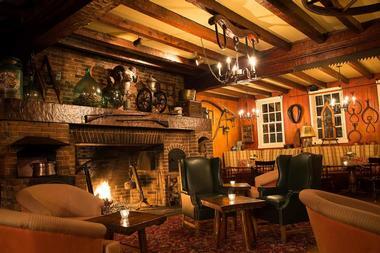 In the Tap Room, guests enjoy a drink in the antique decorated pub. The terrace here overlooks the lake and the gardens. Cocktails are designed with local ingredients, creating a miniature snapshot of the region in a glass. 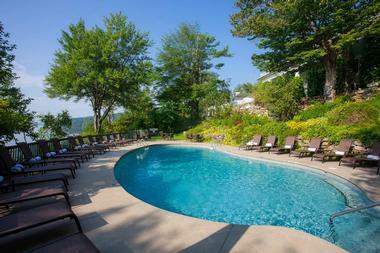 At Manoir Hovey, stresses are reduced with a choice of therapies from the in-house therapists. Indulge with a classic facial or massage or go for luxury with a reflexology session or lymphatic drainage. Summer mornings are met with outdoor yoga classes that are suitable for all fitness levels, allowing guests to get energized for the day ahead. Adding to the hotel’s policy of supporting only locally found flavors, guests can go foraging with one of the chefs every Saturday at 4 pm. Learn about wild edible plants and how they combine to create unique flavor profiles. For those more on the active side, the hotel also offers a clay tennis court and a fleet of bikes with helmets that are ideal for touring the countryside. During the winter, the hotel embraces the cold with ice fishing session’s right on the lake every Saturday. During ice fishing lessons, guests also snack on artisanal pizza while hot drinks keep the cold at bay. The hotel also creates an ice rink on the frozen lake with equipment provided, as well as the opportunity to go snowshoeing. Manoir Hovey is rated as one the most luxurious wedding destinations, owing to its romantic setting next to a lake as well as the combination of serenity and world-class service. Brides and grooms-to- be meet with Julia Brouillard, the in-house wedding coordinator at the hotel. Julia guides couples along the wedding planning process, allowing for a day that is customized to couple’s style and personality. Couple’s also have access to sommeliers that will help them select the perfect wine for their wedding menu - designed by one of the restaurant managers. With access to a planner and the privacy found on the estate, couples need simply express their needs and the team will make their dream wedding a reality. Due to the lakeside and forest setting, weddings at Manoir Hovey are an enchanting affair. Imagine saying an “I Do” amid perfectly landscaped gardens or perhaps like a real fairy tale, next to the lake in the winter as snowflakes gently kiss the surface. For those in more of a corporate mind-set, Manoir Hovey offers tailor-made conference packages that can be put together with the assistance of the events coordinator at the hotel. All venues are equipped with WiFi, to help those not fortunate enough to experience Manoir Hovey for themselves attend digitally. Having been updated and redecorated in 2013, the Abenaki Hall is decked out with the latest in audio-visual technology. The new look includes antique-framed mirrors, contrasted by contemporary touches and pendant chandeliers with a rustic touch. Form here, attendees can take a break while letting the view over Lake Massawippi serve as a mental refresher. The Atkinson Room is situated on the second floor of the manor and the elevated setting allows for breathtaking views of Lake Massawippi. This setting allows for a more intimate venue where private meetings can be held. The room is kitted out with audio visual equipment, while the elegant surroundings allow for a comfortable meeting space. Back to: Christmas Vacation Ideas.